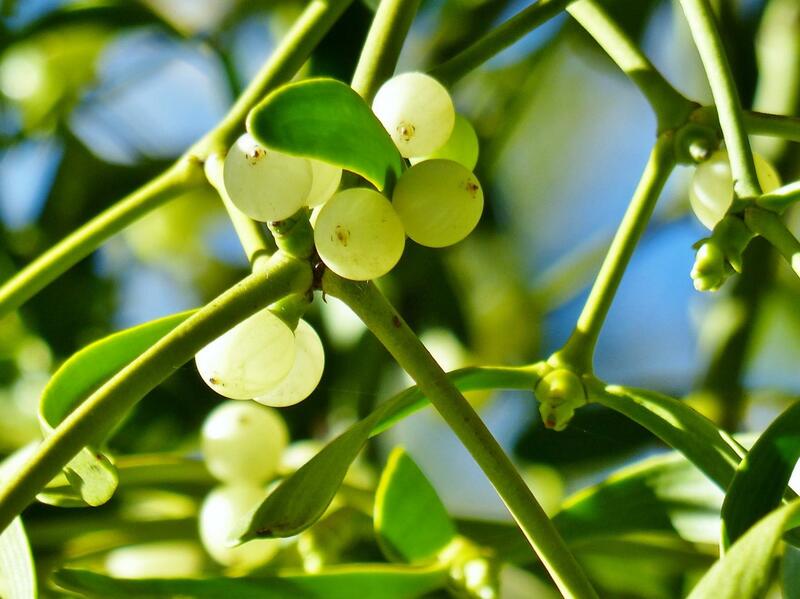 Most people know mistletoe (Viscum album) primarily as a plant to hang up and kiss under at the holidays. But in its natural environment, mistletoe is a hemiparasite (a parasitic plant that is capable of some photosynthesis), latching onto trees and extracting water and nutrients from them. Now, two independent studies reported in Current Biology on May 3 show that mistletoe's parasitic lifestyle has led the species to a rather surprising evolutionary loss. Mistletoe lacks key components of the cellular machinery other organisms depend upon to convert glucose into the energy-carrying molecule ATP. "A loss of respiratory capacity has previously been observed only in unicellular eukaryotes, leading to a parasitic or symbiotic life style," says Etienne Meyer from the Max Planck Institute of Molecular Plant Physiology in Germany. "We are reporting the first case of a multicellular eukaryote that lost most of its respiratory capacity." "There was no known example that life without mitochondrial complex I is possible in multicellular eukaryotes," adds Hans-Peter Braun of Leibniz Universität Hannover, also in Germany. "So, we were definitely surprised to realize that V. album lives without this complex." Earlier studies suggested that the genomes within cellular powerhouses known as mitochondria of Viscum species had lost genes encoding complex I subunits. It was a first among multicellular eukaryotes. But it wasn't proof that mistletoe lacked the complex altogether. There was a possibility that the genes encoding complex I had been transferred from mitochondria into the nuclear genome. Nevertheless, the findings drew the attention of Braun and Meyer. Without knowing about one another, they both decided to take a closer look. Later, the two teams met at a conference and discovered they were following parallel paths, which have now led them to essentially the same discovery. They decided to submit their work to Current Biology as a pair. Braun's team presents biochemical evidence that the mitochondria of European mistletoe completely lack complex I. They also have greatly reduced amounts of complexes II and V. At the same time, they report, complexes III and IV form what they describe as "remarkably stable respiratory supercomplexes." The findings offer biochemical proof that the genes encoding subunits of complex I have not been transferred to the nuclear genome and that this respiratory complex indeed is not assembled. As a consequence, the plant's entire respiratory chain is remodeled. Meyer's team, together with Janneke Balk's team from the John Innes Centre, UK, also found that they could not detect any activity from complex I or its protein subunits. They found that levels of complex IV and the enzyme that synthesizes ATP were present at 5-fold lower concentration than another commonly studied laboratory plant. Other essential metabolic enzymes were detected at higher levels. Their findings add to evidence that mitochondrial functions within parasitic mistletoe have undergone "extreme adjustments" over evolutionary time. Braun speculates that these adaptations to a parasitic lifestyle may save the plant the energy required to assemble these mitochondrial complexes. "However," he says, "this comes at a price," as the capacity for ATP generation by mitochondria is reduced. The work of both research groups indicated loss of ATP generation by mitochondria might be compensated for by ATP-producing processes in other cellular components. That's a possibility that deserves further investigation, Braun says. Meyer adds that the mitochondria of other parasitic plant species should be investigated to determine whether the reduction of respiratory capacity is specific to mistletoe.